Pie Register PRO provides advanced security which lets you display CAPTCHA based on the number of unsuccessful login attempts. 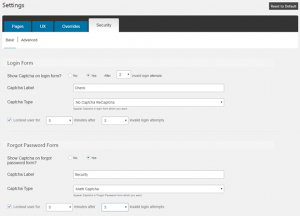 To enable CAPTCHA in Login Form, select Yes or select a number to enable CAPTCHA after a certain number of login attempts in Login Form section. Select CAPTCHA type either Math CAPTCHA or No CAPTCHA reCAPTCHA. Next select minutes to lockout user for after selected number of invalid login attempts. You can also setup CAPTCHA in Forgot Password Form. In Forgot Password Form section select Yes to enable CAPTCHA on Forgot Password Form.